I worked too fast, sorry! I was laying out the locations for the holes and got so captivated that I forgot to take pics for you. So today I'll show it using a paper instead of a top. I think I mentioned last time I did this all the steps that are necessary before I glue the tops on, and doing six of them at the same time sort of expands all of those steps. That's why I made a couple of new templates for the laying out, you'll see that in a bit. First pic, the paper dummy signifies a wooden top. 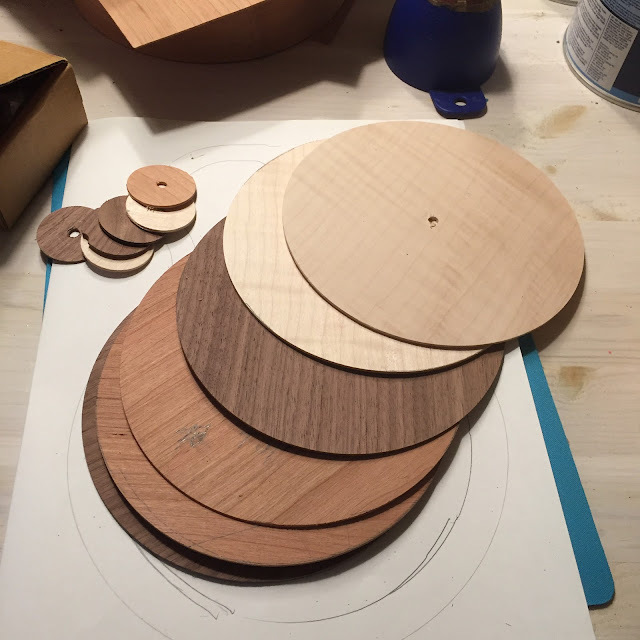 I lay the skeleton on the top, aligning it with the grain and choosing the best area. Any knots or blemishes I place in the well circle. I trace around the body, and in the three holes on the inside. But what I really need is the center, not the circumference. 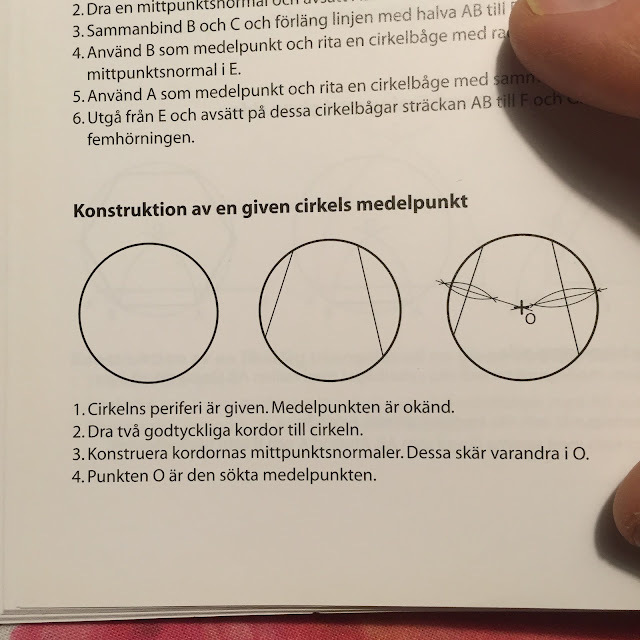 I can find the centre of the circle easily enough, but constructing with pencil and compass on wooden surfaces is a lot harder than it seems when reading about it. 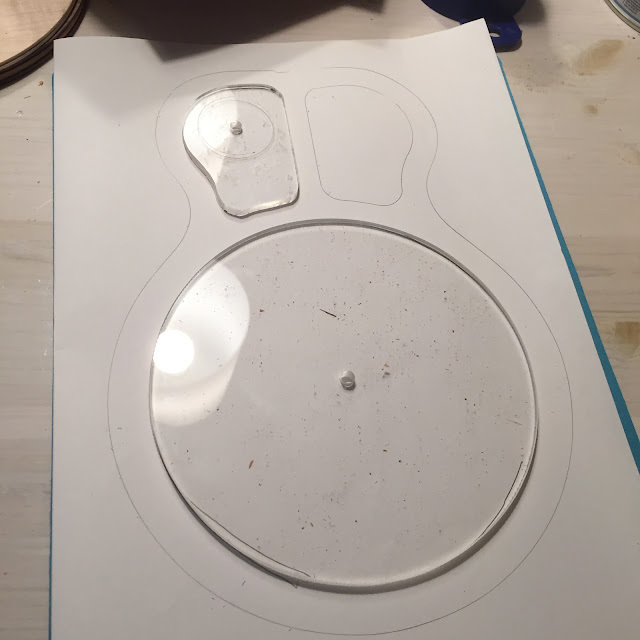 So I cut a couple of perspex templates out, with centre holes which guides the 5 mm drill bit. 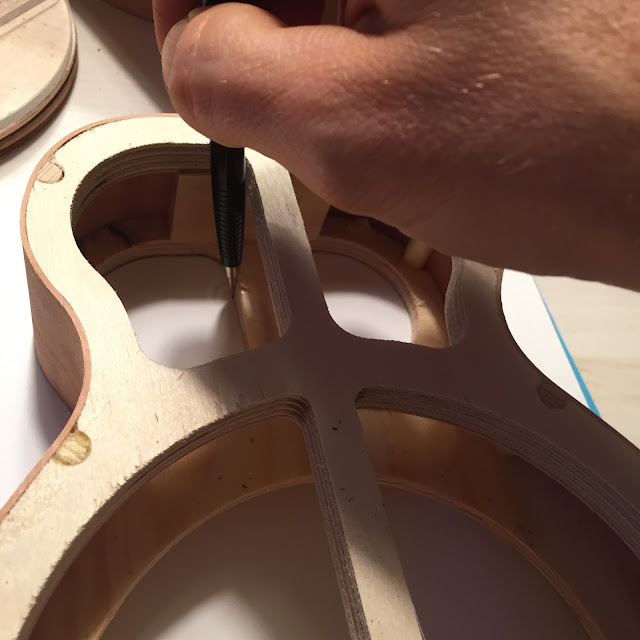 Also, at last I've decided the size of the soundholes and put a mark on the smaller template. 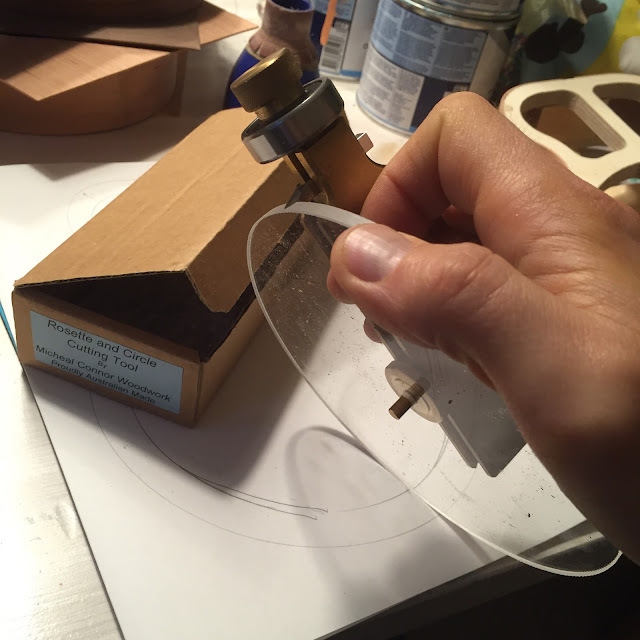 I can even use the larger template to set the exact size on my rosette cutter, a great piece of kit from Micheal Connor in Australia. Setting the diameter to the exact size of the well will save me the horrible task of trimming an internal overhang later. Then I cut all the holes. And this is what it looks like now. 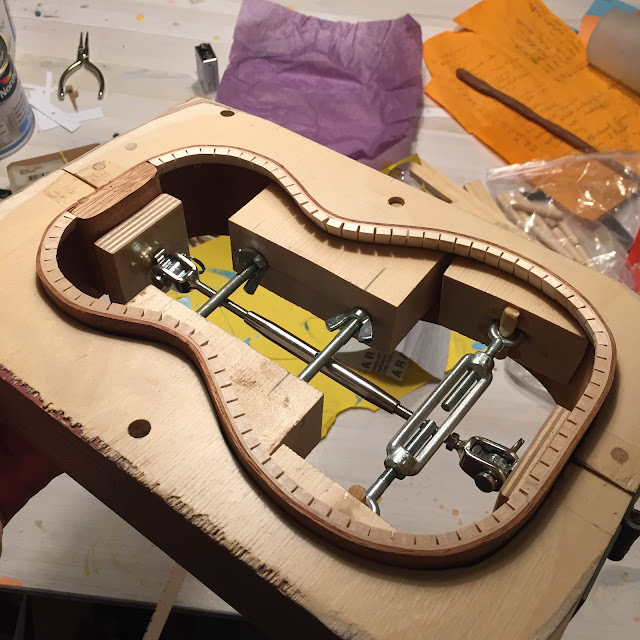 I remembered to sand the edges of the soundholes with my little funnel, so next task is glueing in the mesh screens and then glueing the small scrap blocks around the perimeter to hold the tops from slipping. It'll make sense soon. Also, note the two that have special hole shapes, for Kris and Brian they are. Don't worry, the resos are coming along nicely all six of them. A neck gets carved now and then, the tops are marked for hole positions etc. But now I will show you the latest and presumably greatest in mahogany goodness. The Argapa 100*. In the pic above you can clearly see Angry Monkey and Legöhead arguing about the optimal placing of braces and and bars. It never gets quiet or lonely in the shöp with these guys around. The wood in the soundboard is from dad's old stash from the 1960's, the same as a few other sopranos I've made. Next pic (above) shows the sides, or side as it is a one piece rim. I was going for two halves bent with blanket and form but something went south and I turned to my backup plan and the hot pipe. On the plus side I skipped the end block since I don't have a joint there now. For linings I used a special method. 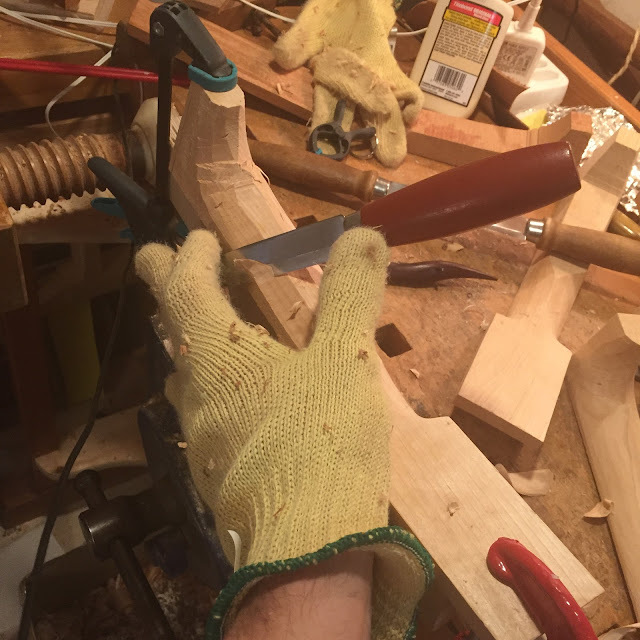 First a thin strip of bass wood bent to shape on the pipe was glued in, and on that the regular kerfed lining strip. The difference in stiffness is remarkable. I haven't decided whether or not I'll bind this uke. Maybe I should, seeing this is number 100 and all. *Getting this to end up as number 100 in the grand scheme of things will require me finishing five of the resos, then this one and then the sixth reso. Doable. My left hand is doing fine. Not a single drop of blood or anything else has emerged since the stitch up and it doesn't hurt a bit. 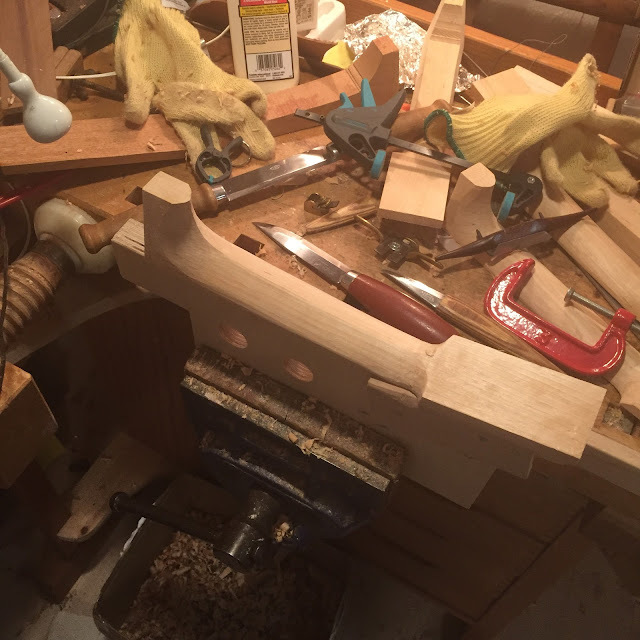 So today it was time to get a move on with all the ukes I'm working on. 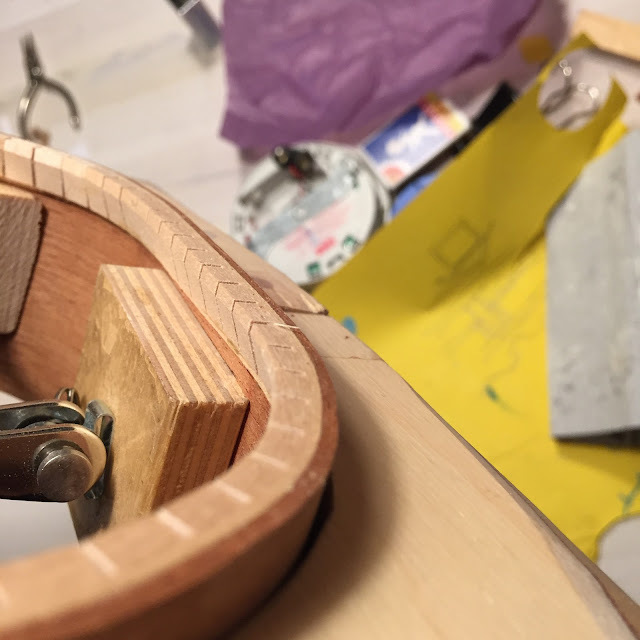 When I bent the sides for the six resos I was sure two or three of them would wait while I worked on the first few, but so far I'm still doing them all in parallel. The neck blanks were prepared and I'm going to carve them all to the stage where they only need a light scraping or sanding. 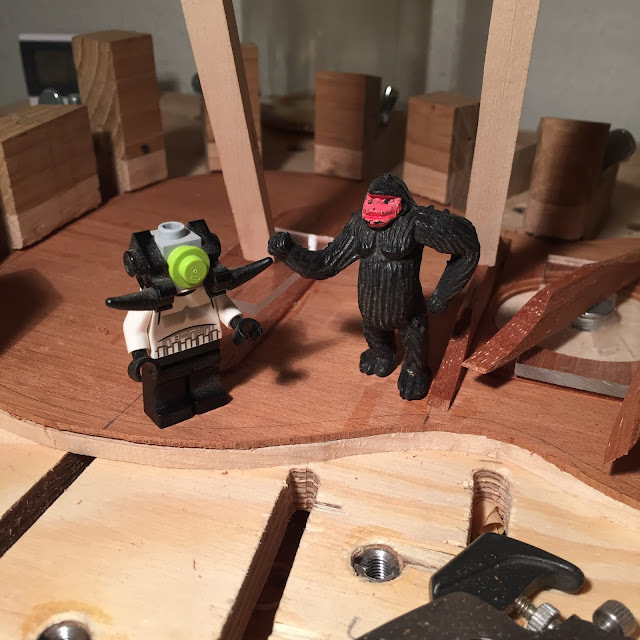 And today I whipped out the drum sander to prepare wood for the Argapa 100, and thought why not take those sides down to the exact height of the skeletons. First a rough cut on the band saw, then some passes with a block plane before sending them through the sander. Look at the stack now! 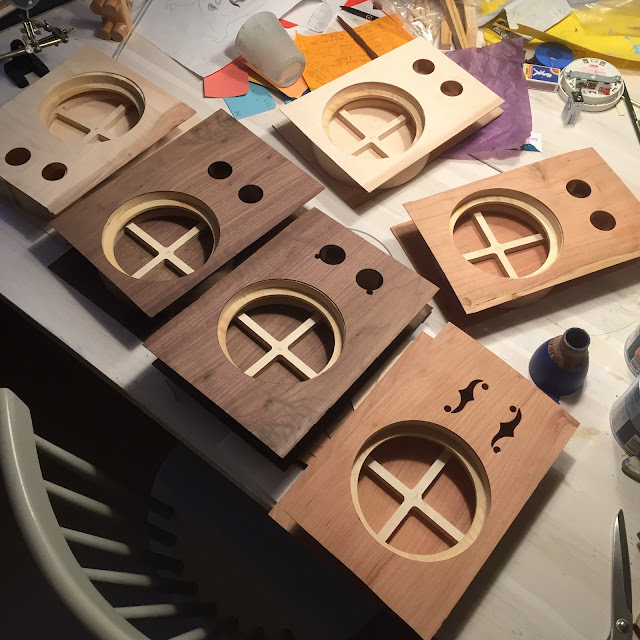 We're getting closer to glueing the tops on, and that means double checking my customers' weird requests for special shapes. Then I fed some of the nice Honduran mahogany through the sander, and laid out a soundboard and a back for Argapa 100. 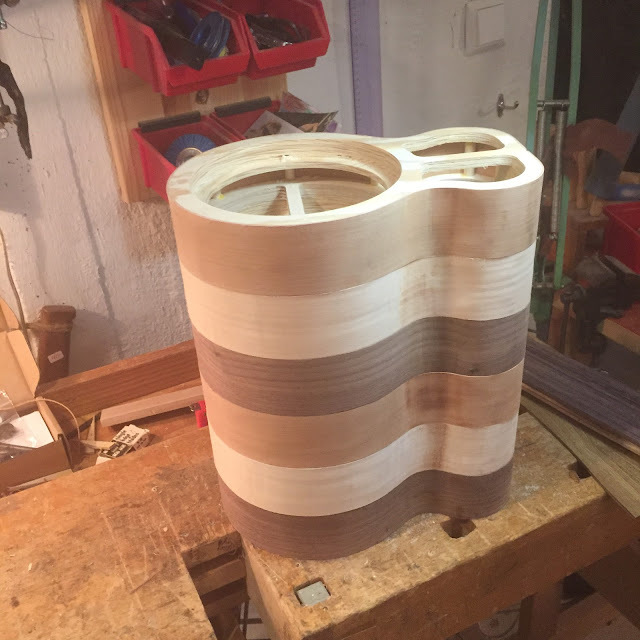 I could also squeeze in either a top and back for a piccolo, or maybe two backs for piccolos with spruce or cedar tops. Or one of each. I'll think about that later, the plan is to make a couple for the raffle at next year's Raystock jamboree. And maybe one for GNUF. I don't know. But today was about Argapa 100. Which was sort of ordered in 2010 by a friend but will be built for me. 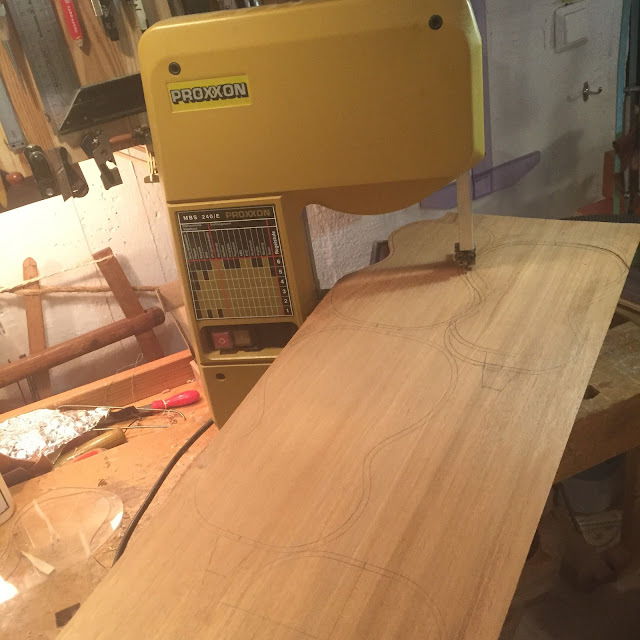 And then of course I carved another neck. I'll carve a couple more tomorrow. The pic shows the kevlar glove on my left hand. I hold the knife with my right hand when I'm not taking pics. And the result then. With no new cuts or wounds.